A previous post outlined an example project and a set of key metrics (KPIs) that I want to be able to calculate based on information gathered from multiple different development tools. In this follow up post, I will illustrate how to calculate one of those metrics using traceability information and an example query over the trace graph. I need information from multiple tools in order to get a complete picture of the project status. In fact, I can produce a diagram of all the necessary information that is required, and how it is interrelated. This is known as the Traceability Information Model (TIM). For my example project, the TIM is shown in the diagram below. Using a traceability analysis tool (as is being developed under the VisTraQ Project as an extension to YAKINDU Traceability), I can collect data (information), that populates the TIM, on a regular basis (e.g. Weekly or Monthly) and then using appropriate queries over the collected data, I can calculate the values that are used to provide my Project Status Schedule Metric (and of course, the other status values). The instances of the types defined in this TIM form a graph of Artefacts and Links known as the Traceability Information Graph (TIG). Artefacts are instances of the types defined in the TIM, and Links are instances of relationships between the types. 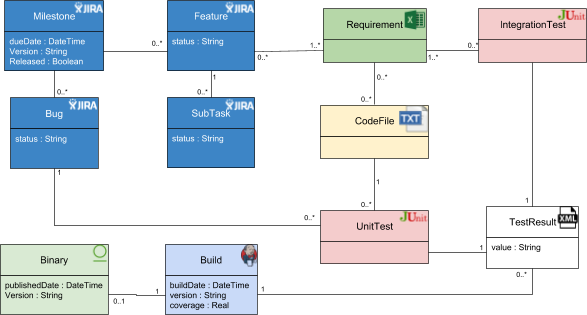 Milestones, Features, Bugs: come from JIRA. Requirements: come from an Excel Spreadsheet stored in a Git repository. 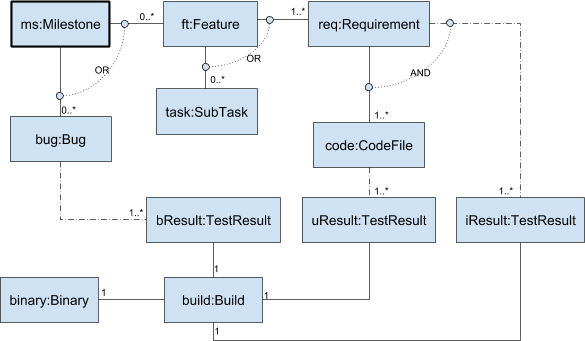 Builds, Test Results: come from Jenkins. VisTraQ has defined a query language that is appropriate for writing queries that collect information from such a TIG. The language is based on the same concepts as Cypher (a graph query language) though it has a few extensions and a more natural-language like syntax. The basis of the language is to define a subgraph pattern which is matched in the TIG, and to perform some calculation on the resulting matched subgraphs. Using this language I will show how to define queries that collect the required information for calculating the example Schedule Metric as defined above. All Features for the Milestone are complete (in JIRA), including all their sub-tasks. All Requirements must have at least one Integration Test defined against them, and all those tests must pass. All Code that implements the Requirement must have a Test coverage of 80%, and they must pass. All Bugs that are allocated to the Milestone must be ‘done’ and all associated Unit Tests must pass. There must be a Binary artifact (e.g. jar file) corresponding to a release Build, that is Published. And we compute an aggregation on this to calculate the total number of milestones, as we will need that in order to provide our end metric. Now, for each released milestone we calculate if the Milestone is met. We have to find, for each released Milestone, a subgraph of the other relevant information that is connected to the milestone. And, we must filter those subgraphs with certain constraints. This expression matches all the subgraphs for each Milestone. To check if the Milestone has been met, we add some constraints that will filter out (of the result) those subgraphs where the Milestone has not been met. To do this we add a WHERE clause. The WHERE clause expression is evaluated in the context of each matched Milestone’s subgraph. All Code that implements the Requirement must have a Unit Test coverage of 80%, and they must pass. The built and published versions should match the intended version defined in the milestone, and they should be built and published before the milestone due date. The other key metrics can be similarly calculated by navigating a traceability graph, though it would need some additional Artifact Types. The VisTraQ research project is in the process of defining the query language illustrated above. The project will also produce a prototype web based application that implements a system to provide the capability of analysing traceability data. This could be used to monitor projects, and calculate KPIs using traceability data, rather than relying on manual reporting. Englischer Text: Dr. David H. Akehurst is a highly experienced software consultant. He has worked for many years in both research and commercial organisations. 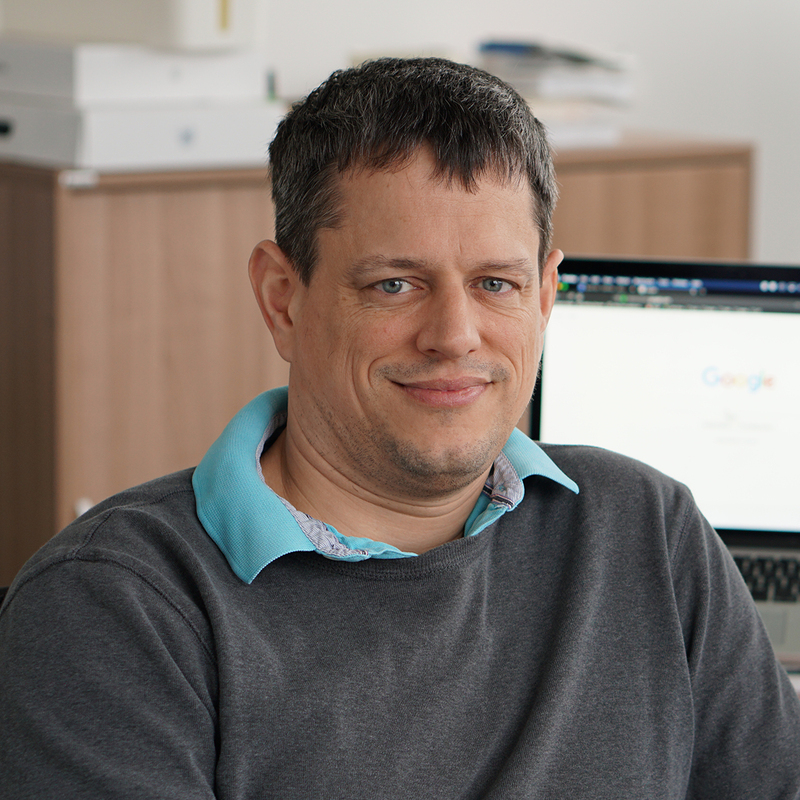 His main areas of interest are language engineering, software architecture, and multi-platform development, e.g., via Kotlin.